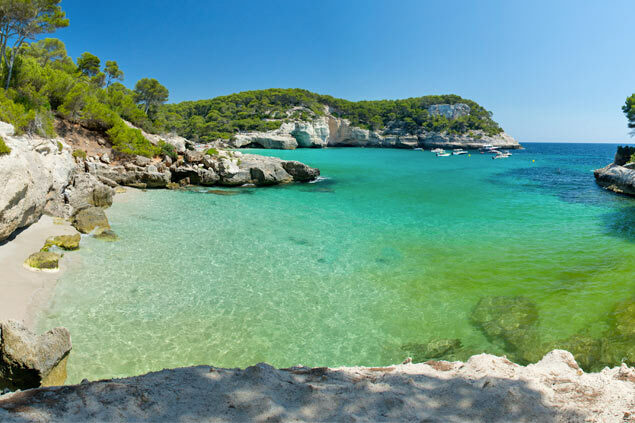 The Balearic Islands are very popular holiday destinations which have managed to maintain their identity, their history and their regional charm. We offer villa rentals in Mallorca or Minorca thanks to our meticulous selection of spacious and luxury houses located in the countryside or by the sea. Whether you are tempted by the countryside or the beach, your comfort isn’t left to chance thanks to our tailor-made holidays. The largest of the islands, Mallorca, welcomes many tourists to its unharmed natural landscapes. You will enjoy its bays, which may be the most beautiful in the Mediterranean. Go walking in the Serra de Tramuntana, a mountain range classed as a UNESCO world heritage site. Discover the Valldemossa Charterhouse, where famous figures such as Frédéric Chopin and George Sand have stayed. And don’t forget to visit Palma, its capital. In this city reputed for its incredibly stunning cathedrale and turquoise sea water, taste a traditional ensaimada while enjoying the beauty of the landscapes. With an hypnotizing charm, there is no doubt Palma will make of your family stay a great and peaceful getaway under the Spanish sun. 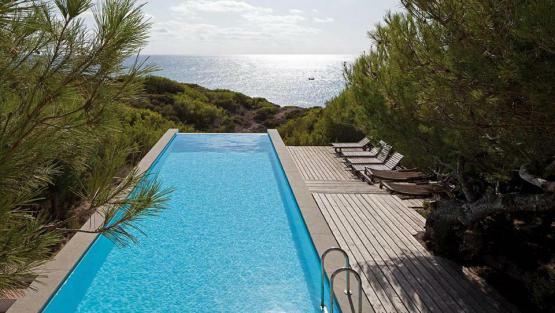 On the island of Minorca, you can choose from a selection which includes a fashionable modern villa just a stone’s throw from the famous Binibeca beach. 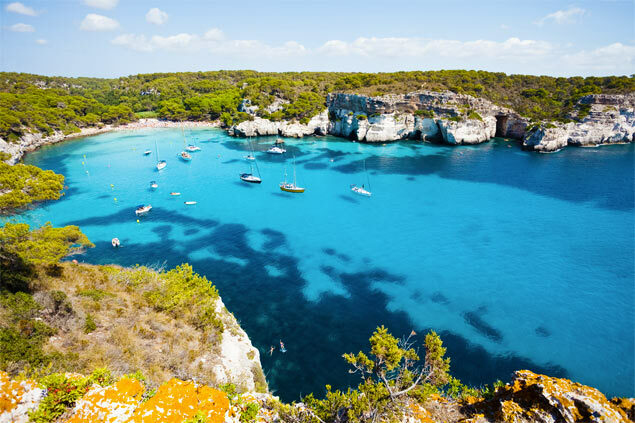 Minorca is a natural gem, the best preserved of the Balearic Islands, where history lovers will find Europe’s oldest building, the Naveta d’Es Tudons, is still standing. The island is famous for its wine, its cuisine, its wild cliffs and its breathtaking beaches. The beautiful Macaralleta bay is a special place and a Caribbean paradise. A desire for green spaces? Head to the Parc Natural de s'Albufera des Grau and enjoy sumptuous views on the Spanish nature in its raw state. et profitez des somptueuses vues sur la nature espagnole à son état brut. 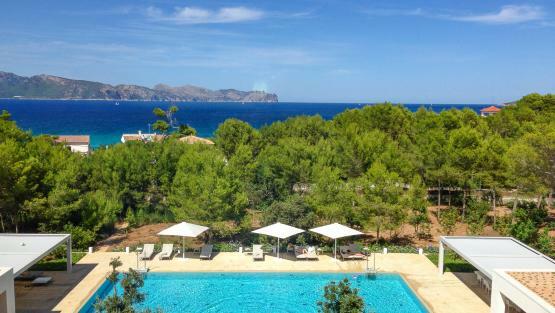 At last, Ibiza, the must-do of the Balearics Islands, is reputed internationally. If you’ve probably heard about it for its nightlife, we’ll never say it enough: the place is an extraordinary family destination. With a hippie culture thanks to its markets, its dream beaches of fine sand and the aquatic sports that they provide, and its citadel of impressive ramparts, there are numerous activities to do on the spot. At last, of course, the ones who like to party will find what they want in many clubs and bars, for an animated stay until dusk. What are you waiting for? 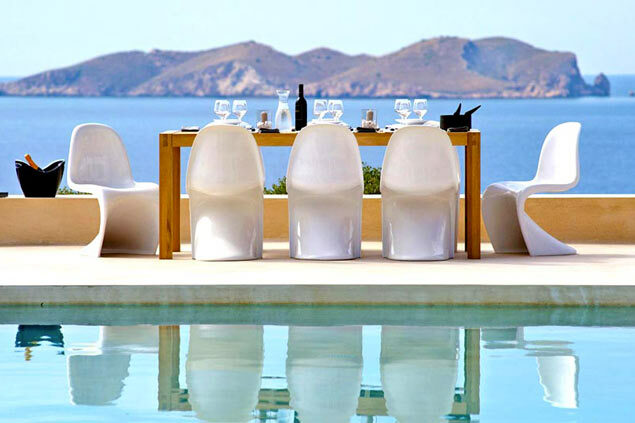 Our mission is to find a Balearic Island villa rental which meets your expectations, combining pleasure, space, luxury, charm and convenience. Your needs will be carefully evaluated by our teams to make sure you find the holiday villa you have been dreaming of. You want a private pool, a fitness room or organizing a private event? It is possible with Villanovo, you just need to ask.